We will create partnership that you rely on by confidence, passion and sincerity. Since its foundation in Sasang, Busan, in November 1992, every member of its staff has been devoted to manufacturing worldwide calipers. By the efforts WOO SHIN has made in the past, WOO SHIN acquried ISO and QS quality certificate system in 2001. And now WOO SHIN supplies approximately 450 kinds of DISC BRAKE CALIPERS to USA, Europe,Canada, Australia and New Zealand more than ten million dollar a year. But we have never been satisfied with achievement we have made. Even now, WOO SHIN is preparing a new challenge to be a brake parts leader. Under the permanent goal that we must become the company, which supplies required products for customers with reasonable price and high-quality. WOO SHIN will be constantly focusing on investments for up-to-date machinery and R&D for better quality. 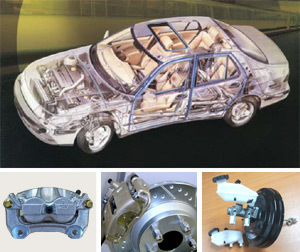 To maximize the customers' satisfaction and minimize their danger in a car, WOO SHIN always considers a caliper as a precise science. The Present status of the developed parts - based on the local classification.